On Wednesday, House Judiciary Committee Chairman Bob Goodlatte (R-VA) introduced the bipartisan AG and Legal Workforce Act (H.R. 6417) – legislation that would mandate E-Verify and create a new agricultural guest worker program. The bill’s introduction represents the first step in fulfilling a promise made by House Speaker Paul Ryan to hold a vote on an E-Verify/guest worker proposal by the August recess, in exchange for several members of Congress not signing the amnesty discharge petition. The AG and Legal Workforce Act replaces the current H-2A agricultural guest worker program with a new, workable agricultural guest worker program, known as the H-2C program. The H-2C program is available to both seasonal and year-round agricultural employers, provides a generous visa allocation to ensure labor needs are met, provides much needed flexibility to minimize disruptions in farm operations, eliminates regulatory burdens, and contains accountability and enforcement provisions. The AG and Legal Workforce Act also requires all U.S. employers to use E-Verify, the effective web-based program that protects jobs for legal workers. The bill also repeals the error-prone, paper-based I-9 system and replaces it with E-Verify. It contains a gradual phase-in for employers—starting with the largest employers first and eventually phasing in small businesses and agricultural employers. While the guest worker provisions in the Ag and Legal Workforce Act are supported by over 200 agricultural groups including the American Farm Bureau Federation, one powerful organization is already taking credit for killing the proposal. 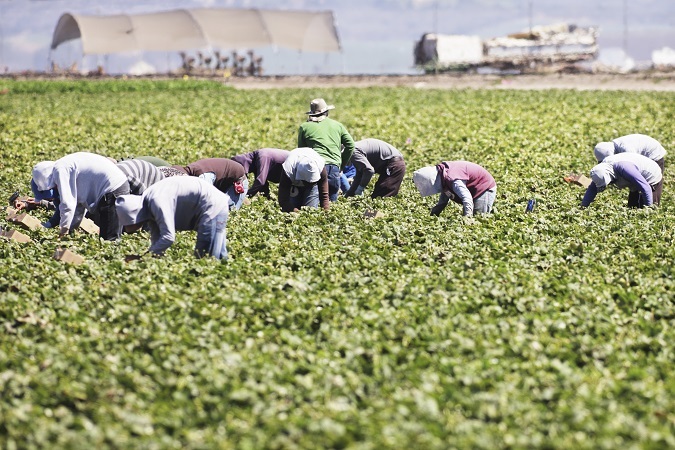 Tom Nassif, president and CEO of Western Growers, an association representing growers of more than half the produce in the U.S., thanked his illegal labor dependent membership for lobbying against the bill as it was being drafted. “We have been informed that the U.S. House of Representatives will NOT vote on legislation next week that would impose mandatory E-Verify (electronic verification of employment eligibility) with no fix for our existing workers,” Nassif wrote in an email last week. “Furthermore, our allies believe this legislation will likely not be voted before the August recess at all, due to our resolve. Those of you who took the time to call members of Congress made the difference. Let us never forget that when we act collectively, with a strong voice, we make real impact,” he added. The response from Western Growers – which has long opposed any attempts to require E-Verify or reduce illegal immigration – is rightfully drawing the ire of some members of Congress. Representative Dan Newhouse (R-WA), an original cosponsor of the Ag and Legal Workforce Act, blasted Nassif and said that the vote promised by Ryan will still happen. Stay tuned to FAIR for updates. Seems like ICE needs to go out and check up on Western Growers farms and plants…. The American citizen has never been against E-verify for harvest guest workers. What is needed is a farmers to take responsibility for these guest worker & see that they are returned to country of origin at the end of the harvests. That means house feed & take care of their health on their farms & ranches It was done very similar when they allowed the boat people in from Vietnam.. The legal Immigrant who came in the front door are insulted by Obama & his administration with his Allowing in illegal foreign nationals & so called refugees. Mandatory E-Verify was promised by Congress to President Reagan 32 years ago………why hasn’t it been passed? E-Verify removes the job magnet for illegal aliens to come………….and costs nothing in relationship to building a wall………..
Why hasn’t it been passed? Congressional members value donations from criminal illegal alien employers over those of their voters! Isn’t there a petition the public can sign to encourage Ag. that the public demands E-Verify? Otherwise, we should stand in the way of those the Ag wants to hire. E-Verify is desperatelying needed for a number of reasons! Vote the bums out of office! And make legal citizen Americans job opportunities/wages shrink while exporting a lion’s share of the food to like Canada anyway on our American tax payer dime to pay for the foreign slaves. You make a lot of good points. The fire in Colorado, for example, was allegedly started by an illegal alien from Europe. The problem is that Big Ag has no desire to actually do anything to reduce their reliance on illegal labor. The worst part, the stoop labor of picking, is actually only a small portion of the end cost of the produce in the market. The rest is packaging, transportation and markups along the way. They could double what they pay pickers and it would only add a few cents per pound, in spite of all the breathless predictions of how “a tomato will be five dollars”. And actually every tomato raised for canning is harvested mechanically. Most things like salad tomatoes, lettuces and herbs could be grown hydroponically in containers. It’s a little more expensive initially but has bigger yields in the end with much less labor and waste. Florida used to bring laborers from Jamaica to cut sugar cane every year and they would return home in a few months and not have to work the rest of the year. Then they decided to sue the growers for conditions and wages and the growers went to mechanized cutting. Ironic that as a country we make a big deal about ending slavery, which was primary about profiting from the cheap labour of black people picking crops without pay, and then today AG interests bring in cheap illegal alien brown people to pick crops instead of having poor brown people come in legally and pay them whatever the higher minimum wage would be. But hypocrisy is as American as apple pie. Yep, they like their cheap labor. But they don’t really need to bring in illegals; they are already in America by the millions. Liberals don’t care that these illegals roam America unvetted. Some of these Ag businesses don’t care that their cheap labor have committed a misdemeanor just by being in America and that many of them have even committed felonies. When these businesses get busted by ICE, they always find a percentage of illegals who have committed crimes in America. I just have to add though that illegals are not all brown. They come from a variety of countries, are a variety of races, and a variety of colors including White; but most are brown because the majority of illegals are Hispanic/Latino. I think that some of these employers don’t want to have to follow the rules or pay out the money for legal workers. Legal workers have protections that illegal workers don’t have. Illegal workers can be treated like crap, as many of them are, and nothing they can do about it. Having workers in America that have protections is better for the American economy. And vetting through E-Verify is better for the well-being of America too.